The LG V20 may not be quite as well-known as some of the other smartphones available on the market today, but it can be a great companion for career women. While juggling your professional and personal lives each day, it helps to have a handy device that makes it all as seamless and efficient as possible. If you’re a strong woman ready to take care of business and have a little fun while you’re at it, check out the reasons the LG V20 makes a standout choice for your next smartphone. You read that right; the LG V20 actually has two screens. 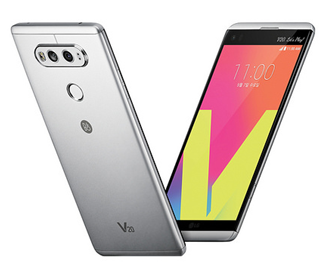 This is a special feature found only in the V20 and its predecessor, the V10. One screen functions as you’d expect for any smartphone, acting as a kind of home screen with a background and all your pinned apps. The second screen, meanwhile, is always on and shows just the essentials so you’re always informed when you’re on the go. Your second screen shows any notifications you receive along with options to add buttons for your favorite apps so you can get them up and running quicker. Plus, you can toggle to access quick settings, like turning on the flashlight, from this smaller screen. You can even add a reminder to this area so you don’t forget to, say, file a report or meet your client at 1p.m. When you first check out the LG V20, you might think it looks rather delicate with its thin bezels and minimalist metal body. It’s even very lightweight when you hold it in your hand. But that delicate look and feel doesn’t show just how tough this phone really is. The LG V20 is actually one of the most durable smartphones on the market right now. It’s made with lightweight AL6013 aluminum, the same metal used to build aircraft, mountain bikes, and sailboats. On the top and bottom of the phone, a silicon-based material adds extra protection against bumps and drops. In fact, this phone can withstand a drop from four feet up and still operate as usual, even if it hits the ground on one of its corners. For women who are always on the go for work, it’s so helpful to have a phone that you don’t have to handle like it’s about to break. And despite the impressive durability, this smartphone has a sleek, chic look you’ll be proud to show in any business setting. If you find yourself feeling a bit impatient with your current smartphone’s lagging response, it might be time to upgrade to the LG V20. First and foremost, it charges up faster than most phones thanks to the Quick Charge 3.0 technology, which can power up your phone four times faster than conventional charging. The LG V20 also boasts a Snapdragon 820 processor and 4GB of RAM to help your phone deliver fast response times. Apps can be opened quickly and you can run multiple apps more smoothly thanks to these features. Use your LG V20 smartphone on T-Mobile, the fastest network in the U.S., and you’ll also get fast internet speeds and excellent coverage for calls. We’ve all become accustomed to having a camera within reach thanks to smartphones, but the LG V20 takes it to another level. This smartphone’s camera is a step above most of the competition and is ideal for any career woman who needs to take crisp, clear photos for work. The LG V20 has a 16-megapixel, wide-angle camera that works incredibly well in low-light situations. It also features an impressive array of manual options that allow you to customize the look of each shot. Those precision controls can also be used to record video in 1080p or 4K. The ability to record the audio from either side of the phone along with video stabilization actually makes it quite easy to create custom videos with this phone. Use the LG V20 to get a step ahead in your career by staying on top of everything with fast, convenient phone features.